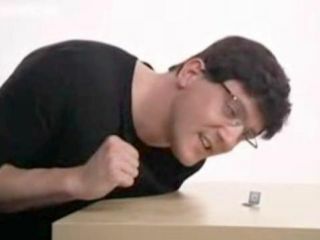 Is Apple's Mactini the world's tiniest computer? Or has it just been made obsolete by the Apple Mactini Nano? Is the Apple Mactini the world's smallest computer? Following last week's lampooning of Mapple Stores and 'Steve Mobs' on The Simpsons, comedian Peter Serafinowicz tears into Apple this week, with a spoof ad promoting the Apple Mactini, the Apple Mactini Nano and the iToilet. "With a standard iToilet account you can have up to 1,200 poos or 8,000 wee-wees," notes Serafinowicz's Apple specialist 'John'. "We've made clean-up fully intuitive, so there's no need to carry toilet paper. You just download what you need, when you need it, right from the iToilet store…"
Serafinowicz's spoof product presentation of the Mactini and the Mactini Nano, from his forthcoming Xmas TV special, actually had us crying with laughter. You can check out the iToilet and Mactini vids right now over on Youtube.